Are you into the hospitality industry and looking for new ways to maximise your outdoors? Among the other hottest trends in shading solution, louvered roof pergola is trending in the hospitality market as it offers the guest a more comfortable outdoor seating option to relax, stay, socialise, and spend some time outdoors without having to worry about the weather conditions. The louvered roof pergola in Sydney extend outdoor seating year-around, providing protection from weather, shelter from the sun, ventilation and reveal beautiful sky views. Current business design trends encourage the development of additional areas outside that are not only cosy but also relaxing and entertaining. The louvered roof pergola can dress up any patio or deck in your resort, café, and restaurant with an elegance that enables an outdoor spaced to be used longer, through wind, rain, or the heat of the summer. Moreover, any business can be benefited from an entry that is printed with the company’s name and logo to attract the target audience. 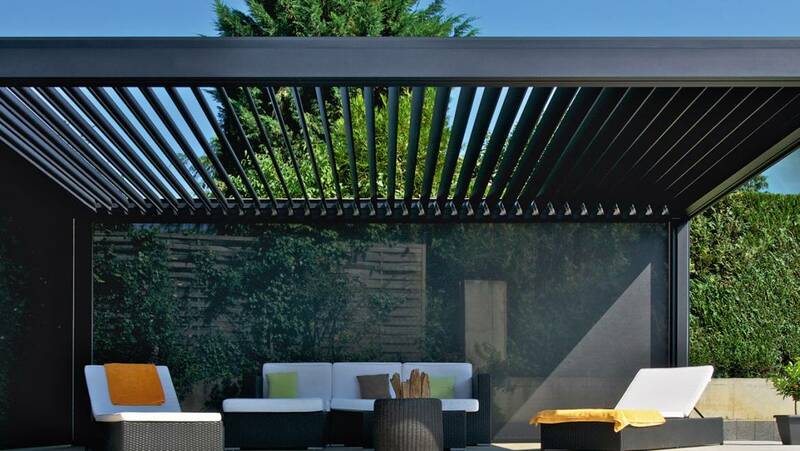 Influenced by current architectural and decorating trends, the louvered pergola Sydney combines technical performance with a sophisticated look. Available in a range of colours, they are suitable for all types of outdoors, from traditional to contemporary designs. The fabric allows the air to pass through while blocking heat, and filter the light in order to keep the outdoor space open and comfortable. The waterproof pergola offers total protection against rain, heat and bad weather. In fact, professionals are impressed with the technology and design of the system. A louvered roof pergola is suitable for all residential, commercial, hospitality uses. Their smooth, anti-dirt surface makes it durable and resistant to mould with minimal maintenance. They are guaranteed to resist fading and degradation from UV rays, ensuring a long-lasting, attractive shade. Engineered to adapt all types of weather conditions, especially harsh Australian climate form rain and heavy snow to high winds, the one-of-a-kind luxury if louvered roofs make a versatile, low-maintenance addition to any business. It offers more usable space for private events such as holiday parties, business meetings, and weddings, providing a rapid return on investment. Suitable for an array of hospitality settings including patios, decks, entryways, balconies, verandas, courtyards, alfresco dining, swimming, spa areas, lanais, and much more. Available in different systems in any size, a louvered roof pergola can be customised to your needs no matter how unique, providing an array of options to match your architectural design or blend into any outdoor design. You can choose from a wide range of colours, decorative columns, and custom end cuts, along with additional features like motorised screens, privacy curtains, built-in decorative lighting and heating and cooling options. If you are in the market looking for a pergola, get quotes from different manufacturers and compare the louvered pergola price Sydney to choose the best that suit your needs and budget.